The recorded version of the Webcast is now available for you to watch! 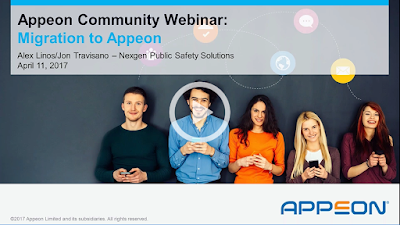 In this Webcast, Nexgen Public Safety Solutions, a software vendor in the public safety sector, will share their Web migration journey and technical experiences in Web-enabling their record management solution (RMS). The Presenters are: Jon Travisano, Developer Lead and Alex Linos, Network Engineer at Nexgen Public Safety Solutions. To view the webcast, please click here! Note: You will have to login to view the webcast however, you can create a free login on the Appeon website. Elevate 2017 PB Conference - Update! Elevate 2017 will be the first official user conference since Appeon began developing new versions of PowerBuilder. The conference is currently scheduled to be hosted at the Harrison Conference Center in Charlotte, North Carolina (USA) on September 25 – 27, 2017. • Showcase yourself and your company. • Build relationships with other users and companies. • Contribute back to the products you rely on. The price of the 3-day conference pass is USD $395 per person. If you present at Elevate 2017 your conference pass will be complimentary. Appeon will begin selling conference passes in May with an early-bird discount. Stay tuned for more conference news here!